A couple of months ago I went on a Yoga and Vegan Cooking retreat and was introduced to Green Smoothies. 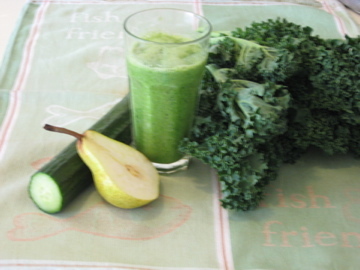 Green Smoothies are a way of drinking your vegies. You blend up some green leafy veg such as spinach or kale, along with some fruit such as pear or banana (to make it more palatable). The secret is to not go overboard on the green leafy veg. You can always add in more veg as you blend, you can’t take them out. A glass of green goodness makes me feel healthy – well it makes me feel virtuous, and that’s almost as good isn’t it? This entry was posted in Uncategorized and tagged Green Smoothies. Bookmark the permalink.